Efficient and resourceful A3 black and white multifunctional optimised for environmentally conscious office and work groups. The cost effective iR3245e is a more sustainable choice for offices and workgroups that need fast and efficient document handling. Canon’s Factory Produced New Model Program has been developed in line with our commitment to serve customers in an environmentally responsible way. Using our long-standing manufacturing experience, we select best-selling models from recent years and rebuild them at our Canon Giessen factory in Germany. By following a rigorous process combined with strict quality assurance, we’re able to offer you affordable, high-quality MFPs with a significantly reduced carbon footprint.. 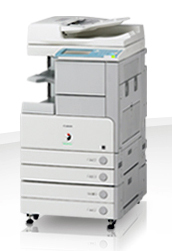 The iR3245e offers print and copy speeds of 45 ppm (A4), as well as colour scan and send functionality giving you the ability to create and share professional looking documents. Auto duplexing enhances productivity and saves paper, while the standard DADF ensures effortless copying. It is easy to operate through a large colour touch screen with the established iR interface, also supporting Mailbox and secured print. The reuse of parts and materials allows us to pass on the savings to our customers delivering a very reasonably priced device. The iR3245e is MEAP enabled and supports a wide number of applications including uniFLOW and eCopy. The device settings can be conveniently configured via iWMC, while e-Maintenance ensures accurate remote device monitoring and meter reading.